Avoid the queues and arrive in style, at this magnificent motor sport event, with a helicopter charter. Experience the Goodwood Festival of Speed, the largest motoring garden party in the world, by arriving in style with a helicopter charter. With room for six passengers and a 25 minute flight from central London, you’ll fly over the traffic congestion and land right in the middle of the action. Our Operations Team will arrange everything for you. Depart from almost any location in the UK, even your garden if it is big enough, and travel to Goodwood in a luxurious and relaxing aircraft. Due to customer demand, all our aircraft are twin engine. These types of helicopters are safer, can fly at night, longer distances and at a quicker speed – they knock 20 minutes off a flight from Manchester to London. They’ve become very popular with the people who fly with Atlas Helicopters and we’re sure you will notice the difference. Enjoy the Goodwood Festival of Speed, a unique summer weekend which brings together a heady mix of cars, stars and motor sport ‘royalty’ to create the largest car culture event in the world. Held in the immaculate grounds of Goodwood House, this annual hill-climb event is a true celebration of motor sport and all things automotive. The video below gives you a perfect idea of the noise, the sights and the speed! It combines a diverse and authentic collection of cars and motorbikes, with star-studded drivers, from current Formula One racers to steam powered carriages dating back to the 19th Century. Enjoy seeing for yourself the cars and motorcycles painstakingly selected to reflect the event’s major theme of the year. Every entry is at the bequest of a personal invitation from Lord March. Their authenticity and provenance are all checked, with all competing vehicles being presented in their original condition and livery. 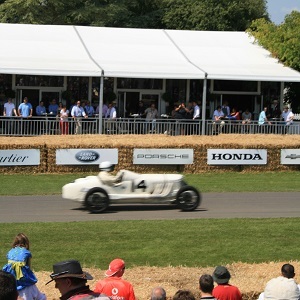 The Goodwood Festival of Speed pays homage to the most significant cars from the history of international motor sport and is an event to be enjoyed by motor enthusiasts and history lovers alike. 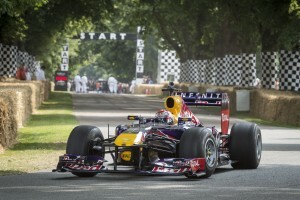 Like most of the major UK sporting events, The Goodwood Festival of Speed attracts thousands of spectators. Owing to the sheer volume of traffic entering and leaving the Goodwood Estate, traffic delays are inevitable, which is why using a helicopter makes sense. You can be picked up from your home if your garden is big enough, or a location as close as possible to your departure point. We will take care of your itinerary, entertainment and accommodation and if you want to a little longer our flexible booking system will adapt to your needs. Beat the traffic, avoided the stress and frustration of an arduous car journey, with a helicopter charter from Atlas Helicopters. To book your helicopter to the Goodwood Festival of Speed, please call our Operations Team today.